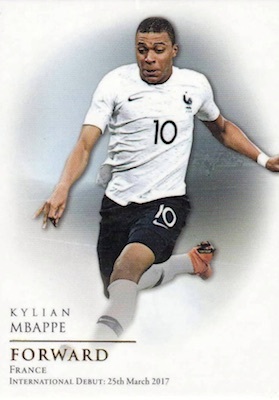 Supplying premium soccer cards with a limited production run, 2018 Futera Unique World Football offers on-card autographs and an assortment of memorabilia cards. Capped at just 240 cases overall, each display box contains at least one hard-signed autograph or a 24kt gold-plated relic or autograph. An added bonus, boxes have a removable section that allows the container to be used for card storage. 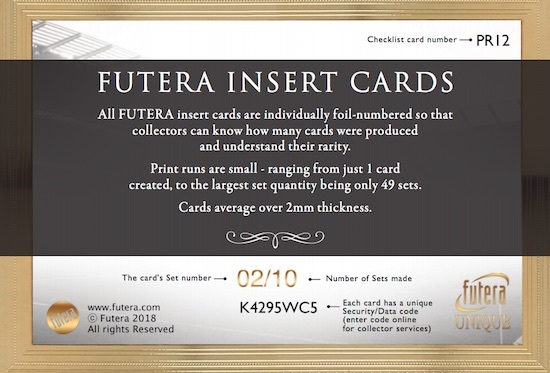 Enhanced with gold foil, each pack features 12 base cards from the 120-card set. These note the international debut for each player. Falling in every third pack, the Heritage insert includes Silver (#/39) and Gold (#/23) versions. 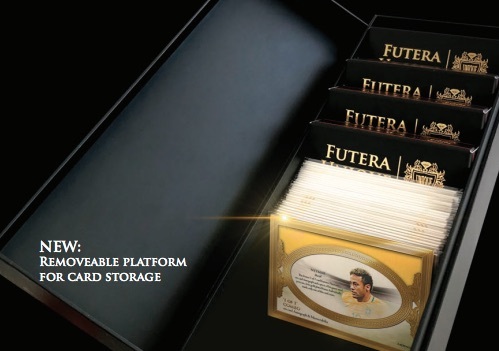 However, as has been the case for years, the central focus of 2018 Futera Unique World Football is the memorabilia lineup. Displaying pieces from many different items used by the featured players, including balls, boots, jerseys and shorts, all are numbered to 49 or less. Full details about each piece of memorabilia are found on the back of the card. Single-relic cards include Captains (25 cards; #/35), History Makers (45 cards; #/35) and The Story of a Legend (50 cards; #/39). 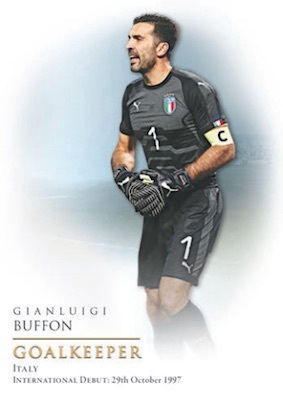 Each offering 10 cards with a print run of 19 apiece, there are also the Italian-themed Libero, Regista and Trequartista sets. In addition, several sets add another relic piece to the card. 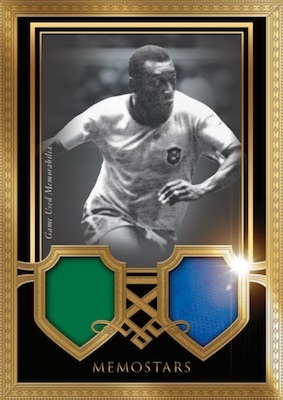 Dual-player editions include Versus (25 cards; #/35) for the on-pitch adversaries and National Heroes (25 cards; #/35) for teammates. 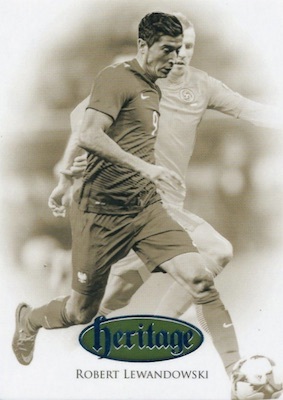 More memorabilia cards come via the Coach (20 cards; #/25), Conquerors (45 cards; #/49), Headliners (10 cards; #/10), Kitcard (25 cards; #/39), Pitchside (20 cards; #/35), Then & Now (25 cards; #/39), and Training Ground (15 cards; #/25) inserts. The rarest relic options include 24kt gold-plated Laces (35 cards; #/2), Memostars (23 cards; #/29) and Mythicals (110 cards; #/7). Of course, there are also multiple one-of-one sets, as well. 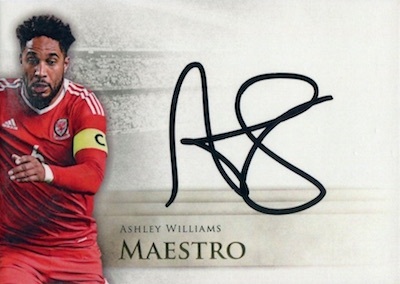 Although not as common as the memorabilia cards, the 2018 Futera Unique World Football autographs make their mark with on-card signatures for many top players. 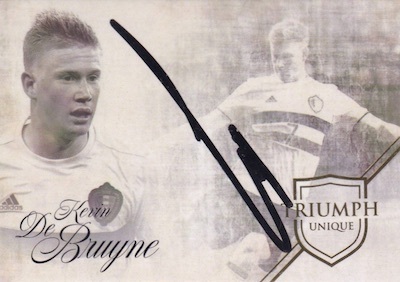 At least three on-card autographs come in every mini-case (six boxes). These add the date and location of the signing on the back of the card. 120 cards. 1:3 packs. Cards have #HT- prefix. Versions: Silver #/39, Gold #/23. 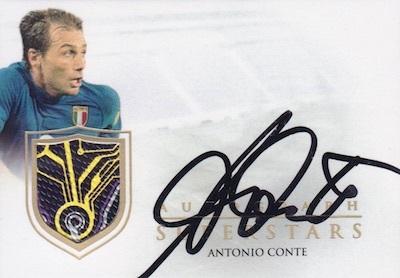 Buy 2018 Futera Unique World Football autographs on eBay. 64 cards. Serial numbered #/35 or less. 59 cards. Serial numbered #/35 or less. 74 cards. Serial numbered #/35 or less. 347 subjects. Serial numbered 1/1. 25 cards. Serial numbered #/35. 45 cards. Serial numbered #/43. 45 cards. Serial numebred #/35. 25 cards. Serial numbered #/39. 10 cards. Serial numbered #/19. 25 cards. Serial numbered #/38. 24 cards. Serial numbered #/35. 20 cards. Serial numbered #/37. 50 cards. Serial numbered #/39. 15 cards. Serial numbered #/27. 24 cards. Serial numbered #/29. 110 cards. Serial numbered #/7. 150 cards. Serial numbered 1/1.